Rajma Masala, which Indian Red Kidney Bean Curry a favorite comfort food to enjoy with rice. You can make this red bean curry in an instant pot or traditional pressure cooker. 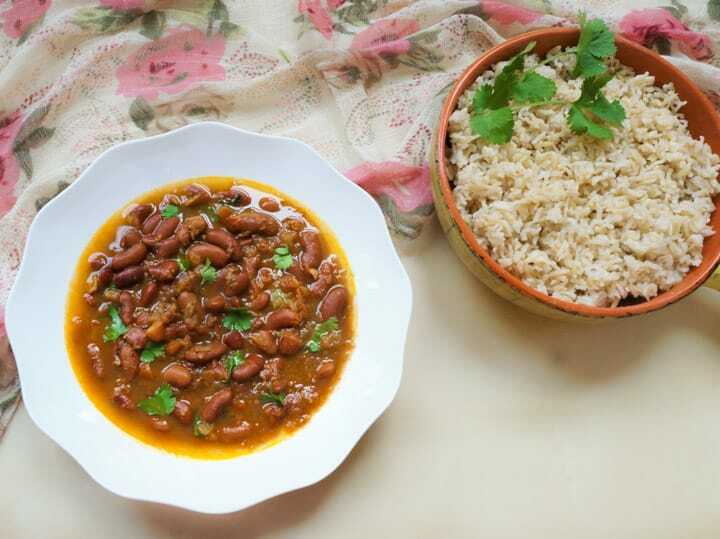 Learn to make Rajma along with pot-in-pot Brown Rice. This is a vegan & gluten-free recipe. Rajma is also known as Red Kidney Beans. They are a rich source of fiber and protein. They serve as a great source of protein in a vegetarian dish. Rajma Chawal (Red Beans with Rice) used to be a favorite meal for me. Being a Punjabi, I was fortunate that my mom used to make melt-in-the-mouth rajma chawal almost every week when we were growing up. So here we will make authentic Punjabi Rajma Masala. Now I like to make rajma in Instant Pot for the convenience. More so, as I can make the whole meal with brown rice in one pot. Rajma is a popular vegan dish from the Indian subcontinent, consisting of red kidney beans in a thick gravy with many aromatic whole spices. It is usually served with rice. The North Indian Punjabi style of making Rajma Masala is the most loved. Combine Rajma with rice, called Rajma Chawal is a popular comfort food in North India. 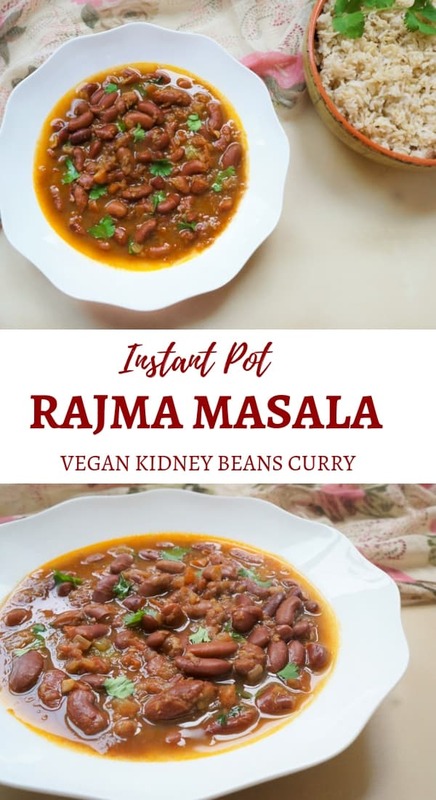 How to make Rajma in Instant Pot? Rajma or Red Beans takes longer to cook, which makes them a perfect fit for pressure cooking. In India, beans are always prepared in a traditional stove top pressure cooker. So when I got the Instant Pot, they were one of the first dishes I tried. I was glad to see a “Bean/Chili” mode, which was the perfect setting to cook Rajma Masala. In this recipe I use basic spices. You can also use Rajma Masala, which replaces all other spices in this recipe. I like the MDH brand Rajma masala powder. 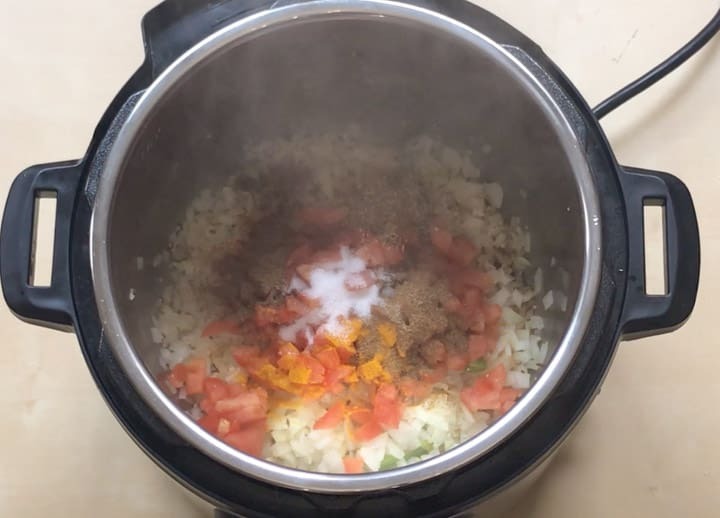 Let’s go through the step by step recipe to cook Rajma in the instant pot. As a preparation, soak the rajma beans in ample water for about 4 hours or overnight. When you are ready to cook them, start with sautéing oil, jeera, chili pepper, onions, ginger and garlic in the Instant Pot. Then saute for 3-4 minutes. Add tomatoes and spices and saute for another 2 minutes. Then you are ready to add the soaked beans and water to the instant pot and change setting to “Bean/Chili” mode. This will set the cooking time to 30 minutes on high pressure. Release the pressure naturally. At this time, you can taste the rajma and if the spice is low for your taste buds, add more Garam Masala. One simple trick to get a thicker gravy texture is to mash some of the cooked rajma with a laddle in the same pot. How to make Red Kidney Beans Curry with Pot-in-Pot Brown Rice? Another important thing with pot-in-pot cooking is to consider the cooking time for the dishes you want to cook together. As an example, red kidney beans take about 30 mins to cook at high pressure and brown rice take about 22-25 mins at high pressure. Hence if I add rice pot-in-pot with beans, they would get cooked well. I would not cook white rice along with rajma, however they would work well with split yellow lentils that cook in 6 mins at high pressure. Garnish with cilantro. Serve with rice, roti or naan. You can also enjoy red beans curry as a soup. 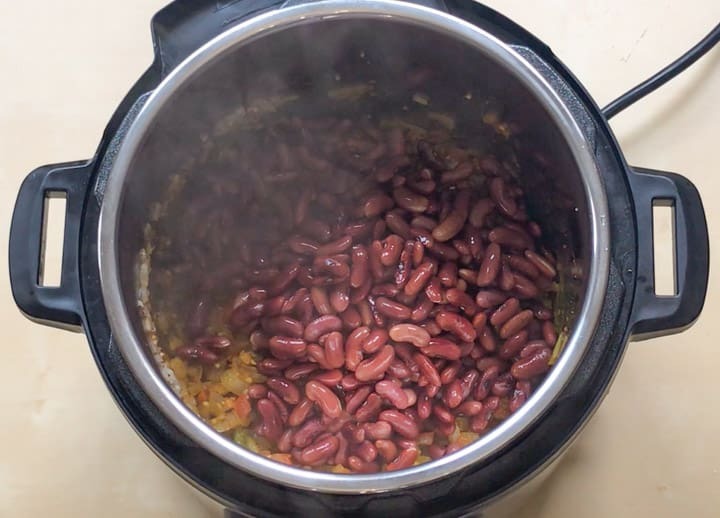 How to make Rajma on a Stovetop Pressure Cooker? Follow the sam steps as above. 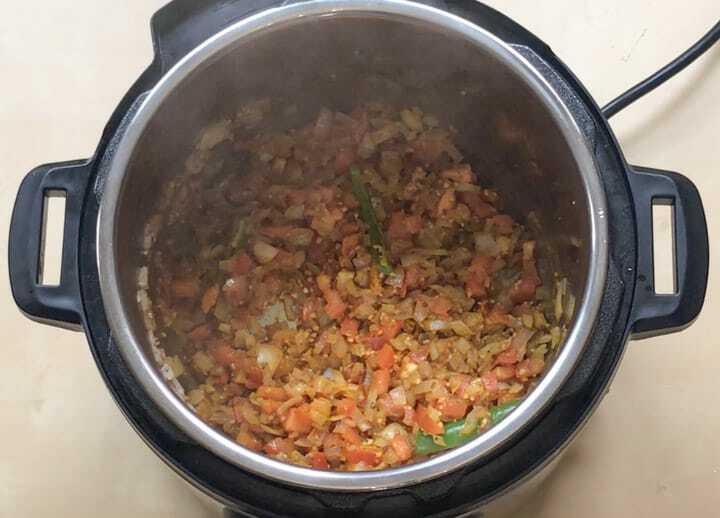 Just cook the rajma on stovetop pressure cooker for 1-2 whistles on high heat, then set the heat to medium and cook for another 15-20 minutes. 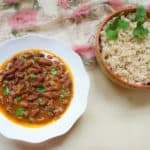 How to make Palak Rajma Masala? Want to add greens to your meal? A great variation to this rajma recipe would to add some greens such as spinach or kale or chard to the rajma. After the rajma is cooked, stir in 2 cups of chopped greens into the curry. Let it sit for 5 minutes so the greens can soak in the flavors of the curry and enjoy! Let’s discuss some common questions for cooking Rajma. Should I soak kidney beans before cooking? I see this question come up many times. For rajma to be well-cooked, they should be melt-in-the-mouth soft. Many people have their preference on whether or not to soak beans. I started with soaking as that is what I have seen my mom do. I like that after soaking the beans are easier to cook and take much less time cooking. Some studies suggest that soaking helps reduce the amount of phytic acid which reduces absorption of important nutrients and aids in digestion. Others suggest soaking does not affect the digestion. So choose what works for you. Sometimes red beans also take longer to cook if they are old. If you have an option to check the packaging date, then buy beans that are not too old. I forgot to soak beans, can I still make Rajma? Let me share the quick soaking method. Heat water in a microwave or stovetop. And soak beans in the hot water for 30-60 minutes. This will give comparable results as soaking for longer. If you decide to not soak, then you can still make rajma. They will take about 45-50 minutes to cook on high pressure. You will also have to add more water as soaked beans absorb some water. I would suggest 3 cups water for 1 cup of beans. 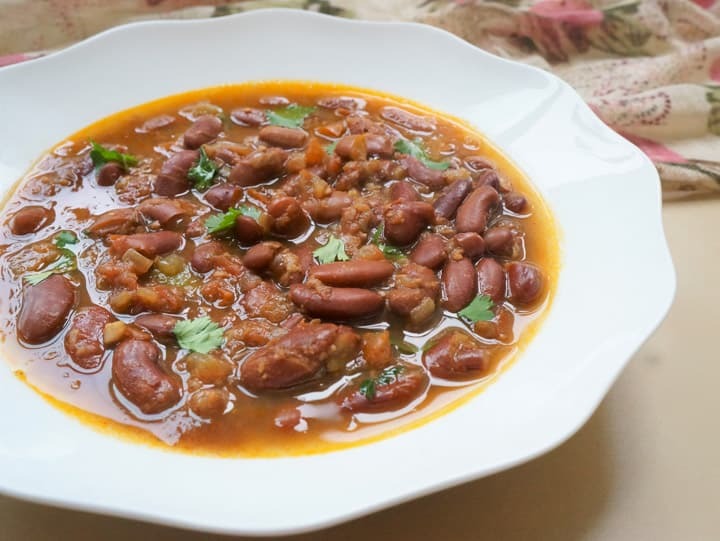 Can I use canned beans in this rajma recipe? 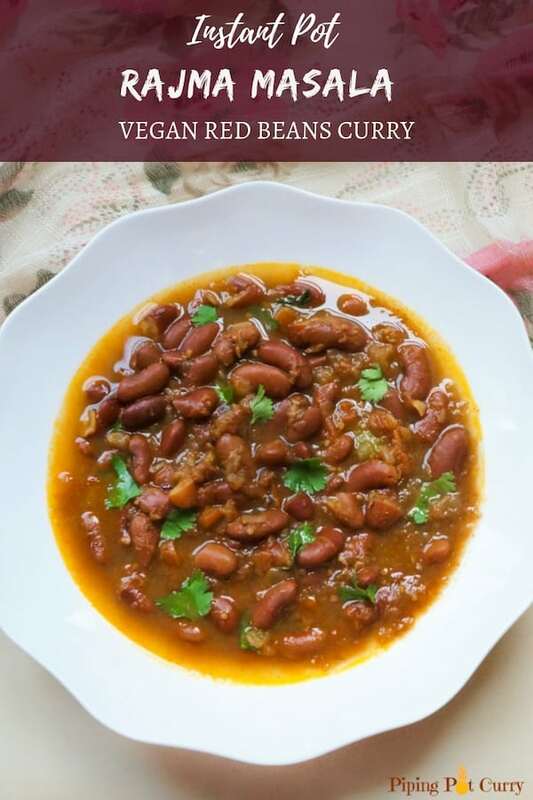 If using canned kidney beans in this rajma recipe, cook for just 6 minutes on high pressure. This will give enough time for the beans to soak in the flavors of the curry. If cooking with canned beans, use white rice for pot-in-pot cooking. What to pair with Rajma Masala? The best comfort food combination is – Rajma Chawal. This translates to red beans curry with rice. Add a veggie side dish such as Aloo Gobi or Bhindi with rajma. Or add some greens such as spinach while cooking Rajma Curry. You might also like side of yogurt or raita with Rajma Masala. Check out other popular recipes – Mumbai Pav Bhaji, Saag Paneer, Chole Masala. 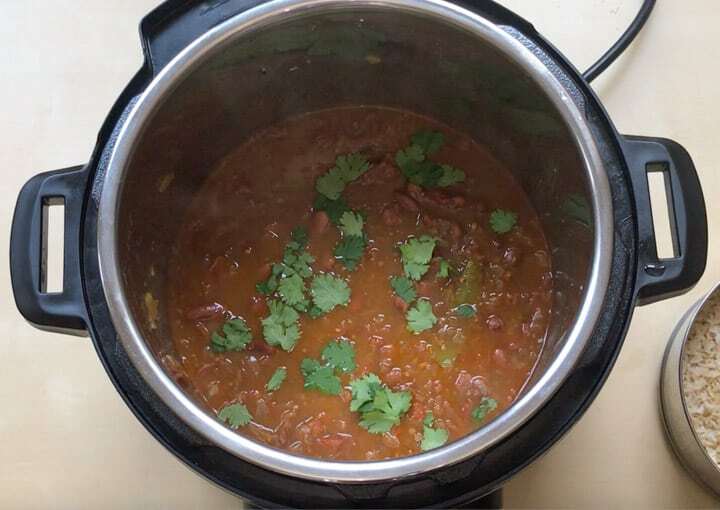 Delicious Instant Pot Rajma Masala or Red Kidney Beans Curry with Pot-in-Pot Brown Rice. 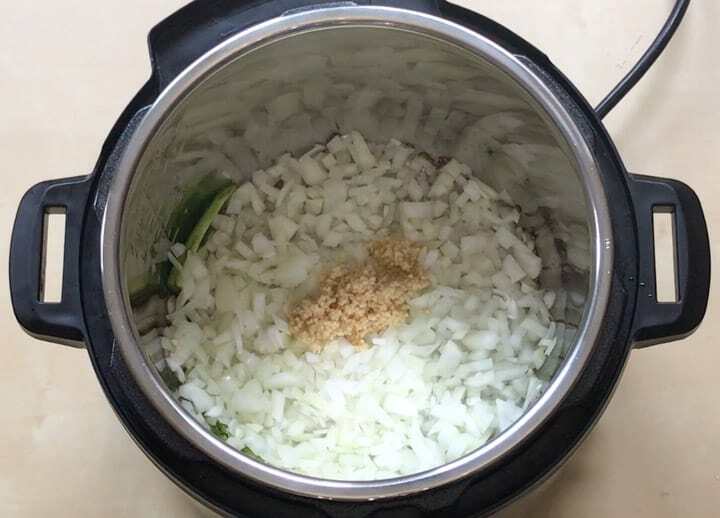 This is a great way to make a complete meal in your instant pot. Start the instant pot in Saute (More) mode and let it heat until it displays HOT. Add oil, cumin seeds and green chili. Add onions, ginger and garlic. Stir and saute for about 3 minutes. Add tomatoes and spices to the instant pot. Stir and saute for 2 more minutes. Add the soaked rajma and water to the instant pot. Stir it all up. Place the trivet. In a bowl, add all ingredients for brown rice and place it on top of the trivet. Close the lid with vent in sealing position. Change the setting to "Bean/Chili" mode. This will set the timer to 30 minutes at high pressure cooking. Once the instant pot beeps, let the pressure release naturally. Using tongs, carefully take out the bowl of brown rice. Then take out the trivet. Add lemon juice and stir the rajma. Garnish with cilantro. Rajma masala is ready. Serve with rice or roti. Thicker Curry: One simple trick to get a thicker gravy texture is to mash some of the cooked rajma with a laddle in the same pot. Canned Beans: I prefer to use dry red beans, but you can make this recipe with canned beans as well. If using canned beans, you want to cook on manual for about 6 minutes with natural pressure release. If cooking with canned beans, use white rice for pot-in-pot cooking. Rajma Masala Spice Bend: If you have Rajma Masala, you can substitute all spices with it. Just add the salt and garam masala to your taste. What to pair with Rajma Masala? Enjoy Rajma Masala with rice and a side of yogurt or raita. 30 mins on bean setting made the rajma mushy. I feel 15-20 mins should be max. Hey Mohit – Sorry to hear the rajma were mushy. I have always found that for the rajma I buy, 30 minutes is required. But please do adjust the timing as needed. Thank you for sharing back your experience. I just bought instant pot and came across your website. Both are truly made for especially busy working moms like me. I tried your pasta and rajma and it’ came out awesome! Next on my list is soups and chicken. Never made chicken curry before so excited to try. 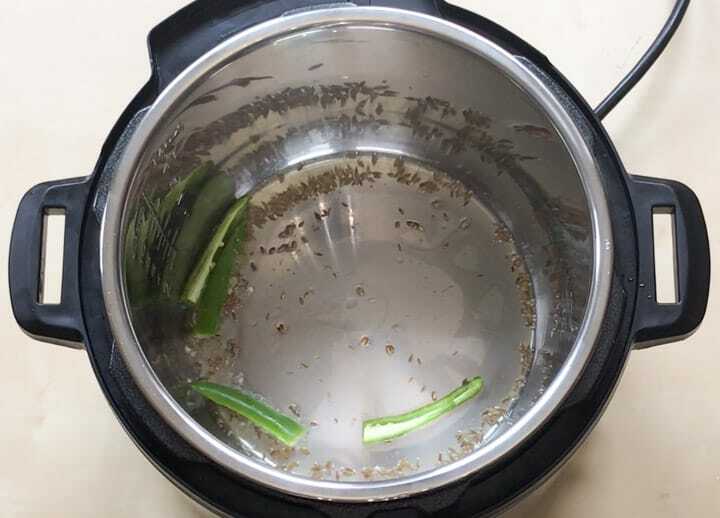 Hey Anu – So glad the instant pot and the website are helping you as a busy mom. Would love to hear how the chicken curry turns out! Made your Rajma Masala last night and it was a hit! Thanks for the lovely recipe. Hello Mehernaz – Happy to hear you enjoyed the Rajma recipe. Thank you so much for sharing back your rating! I followed your recipe and the kidney beans got burnt. Trying again with 3 cup water instead of 2. Hello Preety – Sorry to hear. That is very odd. Just trying to troubleshoot – Did you soak the rajma for 4+ hours? 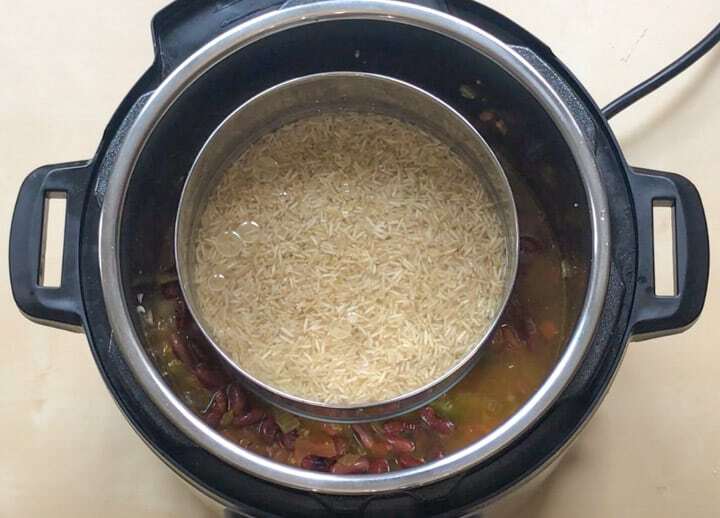 Did the instant pot seal properly? As if it is not sealed well, all the liquid dries and then there can be a burn. Please let me know how it worked out. I hope you all enjoy it, Sasikala! I tried this recipe and the beans did cook well but it turned out slightly watery and bland. Any suggestion as to how I can make it more flavourful and not so watery? It might also just be my tastebuds, not sure haha. Hey Kiara – It is absolutely fine to tailor the recipe to your taste. In North India, rajma is typically enjoyed with rice and hence has a bit more liquid. You could reduce the quantity of water added. Also, as the rajma cools or when you refrigerate, it thickens. Also, feel free to increase the amount of garam masala to get more flavor. Thank you for sharing your review! 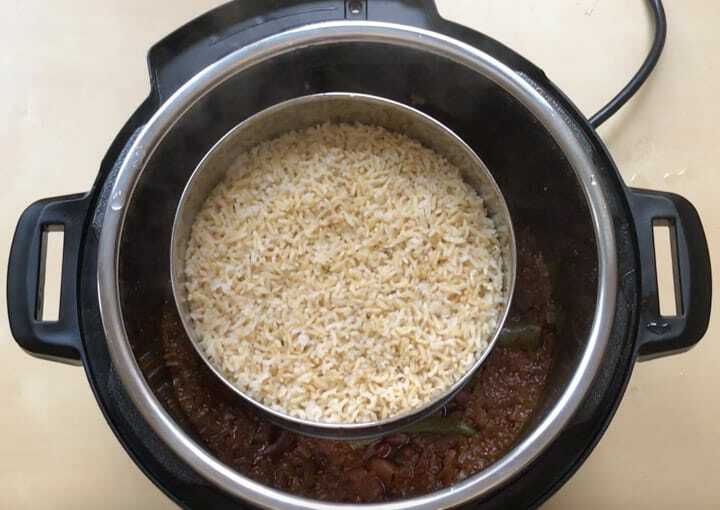 Hi, Some posted your recipe on Facebook – Instapot 101. Glad I saw it. Am going to try your recipe ! I am not familiar with the Indian spices – perhaps I can find them on Amazon ? Or maybe locally. I am near Austin TX so I expect there maybe some stores that specialize. Looking forward to making this ! Hello Carol – Thank you for coming over and checking out the blog. I am sure there will be Indian grocery stores in Austin, just try a google search. If you find a store nearby, I am sure the in store spices are much cheaper than on Amazon. I hope you enjoy Rajma! Hi! Just made this recipe and my husband and I are looking forward to dinner tonight. I have a question though. I used a serrano pepper. I’m just learning how to cook with chili peppers so I’m not knowledgeable about which kind are best to use in various dishes. I hope the serrano was ok. From the picture of your dinner it looked like you diced the pepper, but in your video it looked like 4 long slivers. If there are just long slivers, are they too hot to eat like that or do you cut them up into littler pieces. My husband and I LOVE hot, spicy food but we’ve learned to be cautious after one excessively spicy dish! I have some rajma masala. How many tbsp of that should I add? Hey Kiara – About 1 tbsp of Rajma Masala should be enough. I hope you enjoy it! I generally soak the Rajma overnight if I am using regular pressure cooker. I just like the taste better when it is soaked for longer. Will the cook Time be same if I soak the Rajma overnight? I hope it will not get mushy if I keep it for 30 mins. I am not planning to do PIP. Also, I have an IP LUX 5qt with no Bean/Chili mode. Should I just do manual 30 mins for overnight soaked Rajma? Options I see are soup/broth or meat/stew or porridge or slow cook…never tried any of these before. Thank you so much Meeta for the quick response. Coincidentally I also prepared kheer today but using traditional pan method as my IP lid still smells like butter chicken I made 2 days back ???? I did try the vinegar steam method but it still has some the savory smell and I didn’t want to take risk with my kheer. May be i should get the colored rings. Hey Shruti – What a coincidence about kheer 🙂 I agree having a separate sealing ring for sweet foods, especially ones with milk is very helpful.